This entry was posted in General News, Research and tagged ACES, Alabama Cooperative Extension System on September 26, 2013 by Wire Eagle. AUBURN UNIVERSITY – The head of the Alabama Cooperative Extension System’s aquaculture resources team and a fellow Auburn University faculty member are working to gain a deeper understanding of algal blooms, those prolific aquatic organisms that are increasingly causing headaches not only for water treatment facilities, parks and zoos but also for pond owners and others exposed to these blooms. The researchers will use this heightened understanding to educate people about how they can prevent the spread of harmful blooms and to reduce exposure to them. This effort is made possible with funding from the U.S. Geological Survey. Russell “Rusty” Wright, an Extension fisheries specialist, aquaculture resources team leader and associate professor in the School of Fisheries, Aquaculture and Aquatic Sciences, and Alan Wilson, an associate professor of Fisheries, are especially interested in blue-green algae, also known as cyanobacteria, taxa known to produce off-flavors in public drinking water. The two recently worked with a southeastern municipal water supplier to address taste issues stemming from the presence of blue-green algae. Wright and Wilson are also investigating how some chemical compounds associated with these blooms, particularly methylisoborneol and geosmin, work to compromise the taste of catfish and other aquaculture products. The research team also wants to gain a deeper insight into the natural factors and human practices that contribute to the growth of toxic algal blooms, especially in freshwater systems throughout the Southeast. In rare cases, cattle with access to contaminated ponds have died from exposure to these toxins. Because of their small body size, children exposed to toxic algae are considered especially susceptible. Wright and Wilson also are monitoring the growing number of invasive species, particularly Lyngbya, a cyanobaterium native to Asia. 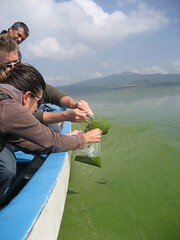 This algae forms large surface mats on the bottom of lakes that quickly cover and smother native species. While Alabama’s warm, sunny climate is highly conducive to algal growth, Wilson said this project represents the first sustained effort to build a comprehensive picture of algal blooms in Alabama as well as throughout the southeastern United States. Part of this effort involves working with state agency scientists in Alabama and other states to collect and share water samples and water quality data. This collaborate network now includes 15 states and Puerto Rico. Wilson said the project is a good example of how land-grant university research and Extension often work hand-in-hand in the interests not only of advancing the boundaries of science but also in training volunteers and building public consensus behind the effort. Wilson ultimately hopes to use the data to construct a series of models to predict where algal bloom-related issues are most likely to occur.